Today is Foursquare Day, which seemed to be a good time to take a look at how Foursquare has changed recently, and how that's affected my use of it. Recently, Foursquare has explained that the "game" aspect of the service had been too prominent, and what they really wanted to emphasize was "search" -- helping users discover interesting places to go. Given that I originally got interested in Foursquare as a game, this is not a good development. Particularly since it has never been a great game. The points system has never been that interesting. The mayorships, while interesting, are too open to cheating. The badges have probably been my favorite part of the game. Now that the mayorships and badges no longer post to Twitter and Foursquare, even that is less exciting -- bragging about "accomplishments" has always been part of the appeal. The only people who will see that I got the "Zoetrope" badge are those who happen to look on Foursquare. And there are fewer of those friends. I have 12 friends on Foursquare. Two have never checked in. Three last checked in during 2010. Of the remaining seven, only three have checked in this year. This came together in an amazing way just over a week ago. I was reminded of a year-ago series of checkins including a toy store and a JC Penney. That brought back memories of foam swords we had bought the boys, pushing the stroller around JC Penney in a desperate attempt to calm them down, and discovering that one of the two swords had gone missing. (The toy store had sold out of them by the time we went back and said they weren't getting any back in stock.) Since we can't have just one of any toy if we expect to keep the peace (and since I found it too depressing just to throw it away), the sword lived in my car for a year. I reflected on that to start the day, then Christina and I had our first real date of the year -- the kind of day that I'll really enjoy looking back upon in 2014. Since the babysitter was engaged for a fixed period of time, we had half an hour to kill at the end of the date. Of all places, we ended up in Walgreen's. We walked in, and there was a display with the exact type of sword that had gone missing a year ago. Weird. Anyway, my quest for "gamification" of daily life has moved beyond Foursquare -- mostly to Untappd, a beer check-in service. But I'm still enjoying Foursquare, almost entirely as a way of capturing the aspect of my history, "Where was I on such-and-such a date?" It's a Chili's. Right? We're at Chili's, aren't we, not Applebee's or Ruby Tuesday's or whatever? Nope, definitely a Chili's. 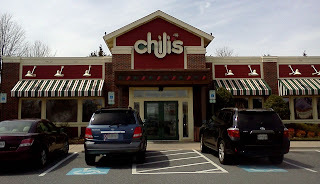 One reason that I know that I've been to a Chili's before -- and can thus dispense with a second visit, according to my review rules -- is that I know there is one in the hotel that the Euroquest gaming convention used to be held in. One time, on a break from gaming, Martin and I were approached by the waitress who asked if we were familiar with their menu. Martin assured her that he came there all the time. After she left, I expressed surprise at this response and he said something like, "I don't know that I've ever been to Chili's in my life; I just didn't want to hear whatever she wanted to tell us." 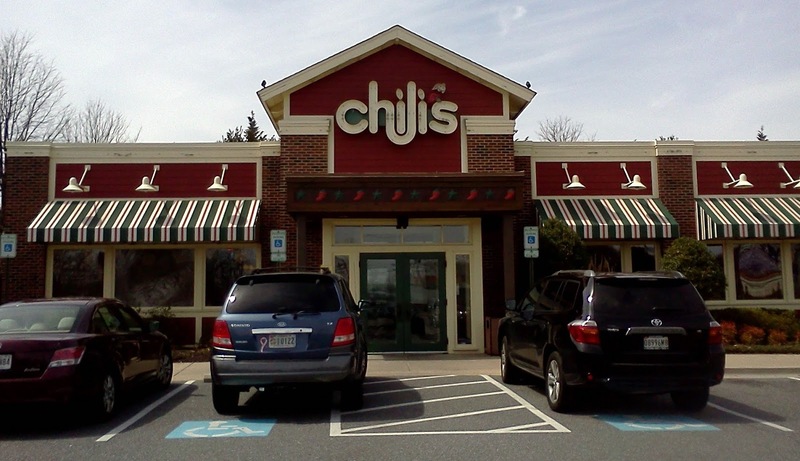 Although the service this time was not particular enthusiastic, I saw more instances of where Chili's was more interested in a relationship with me than vice versa. For example, signs and notes on the menu reminded me to download their app, where, among other things, I could request songs on the jukebox without actually getting up and walking over there. A bad cell phone picture of the "Ziosk"
The one thing of some mild interest was the "Ziosk", a console that took up a large percentage of the real estate on our surprisingly small table. Most of its offerings were duds -- advertisements for specials, or offers to pay $1.99 to play games I could probably find on my phone for free. There was a chance to re-order drinks. When our waitress had disappeared for a while (as I said, the service was not the best), I tried to use it to summon water, but was told we had not ordered drinks. I assume it only works on booze. The Ziosk did shine in one area. It lets you pay your bill, which may have helped us recover some of the ten minutes we waited for someone to show up and seat us at the beginning of the meal. 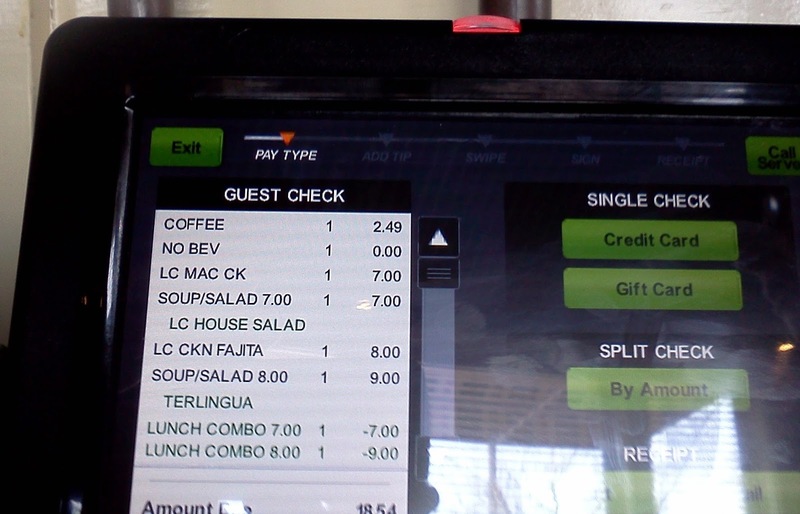 In particular, we were able to split the check and each pay via credit card. It's always very annoying to split a small check between two or more people -- and I probably would not have done so via credit card if not for the Ziosk. And I was able to get the receipt via e-mail, so there's that. What about the food. It was adequate. I got the chili, which was comparable to Wendy's, and the fajitas, which were fine. My colleague got the "Southwestern Mac 'n' Cheese with Grilled Chicken," which was also fine. Both it and the fajitas were presented on a little skillet, which was reasonable. So it ends up with the ever popular 2.5-star rating (awarded in 7 of my most recent 11 reviews). It might sink to 2 stars without the Ziosk, which solves the hypothetical-yet-plausible scenario of, "I'm going out to lunch with a bunch of people and it's going to be a pain to split the check." Looking back, I used to review a lot of movies on this blog. At least six in 2000, four in 2001... But it looks like the last review I published was in 2005 for Kung Fu Hustle, a movie I didn't even remember seeing. Well, there's a reason I write reviews, so I'll be able to remind myself of things I don't remember seeing. Anyway, I decided I wanted to vote on the Hugos for the Best Novel category, but that also makes me eligible to vote for all the other categories, and I feel like I should make some effort in at least some of those categories. So the nomination of Looper motivated me to look for the copy we've had from Netflix for over a month. After Christina found it, we watched it last night. My verdict: not bad, but not something I want to give an award to. One weakness was that things happened in the movie that seemed solely done for plot convenience. I mean, time travel is always a little bit ridiculous, but even after being invented and then outlawed, its main use is disposing of people the mob wants killed? Really? And why does "Old Joe" fight so much better than "Young Joe"? It's because Bruce Willis was in Die Hard and Joseph Gordon-Levitt was in 3rd Rock from the Sun, isn't it? The characters, while not really ones I could relate to, do experience some interesting moral dilemmas. The implications of time-travel paradoxes are somewhat interesting, but nothing really mind-blowing like a good time-travel story. I mean, really, this movie didn't hold a candle to The Time Traveler's Wife. I think I liked it better than The Avengers, the only other of this year's nominees I've seen. On the other hand, I watched that movie in a very distracted fashion, and it's gotten so many good reviews, maybe I will try to catch it again when it is available on Netflix streaming. But the "No Award" option on the ballot is starting to look good.